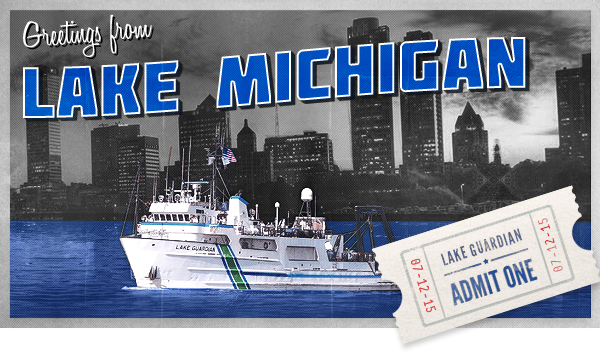 Teachers and non-formal educators can set a course for adventure and professional development this summer with a week-long workshop aboard the EPA research vessel Lake Guardian. The Shipboard Science Workshop will give teachers grades 4-12 a once-in-a-lifetime opportunity to work alongside scientists as they conduct field research across Lake Michigan. Applications for the 15 available spaces are due February 10. The annual research cruise sets sail from Milwaukee, WI on July 12. Onboard sampling will give educators from a variety of disciplines an opportunity to learn first-hand about the unique ecology of Lake Michigan as well as how people’s actions are affecting the region. Port stops along the way will also allow participants to learn more about Great Lakes recreation, history, and stewardship before returning to Milwaukee July 18. Educators will collaborate on new ways to incorporate hands-on research into their classrooms and share ideas for classroom activities that boost understanding of Great Lakes issues. Sea Grant specialists will provide educational resources and support while onboard and will help teachers implement new activities after the cruise. Participants will receive a $500 stipend at the end of the week-long cruise that could be used to help cover any travel expenses to and from the launch point. Application details are available at www.surveymonkey.com/s/lakeguardian2015. Contact Terri Hallesy with any questions. The Shipboard Science Workshop, which takes place on a different lake each year, is hosted by the Center for Great Lakes Literacy and coordinated by the Great Lakes Sea Grant Network and the U.S. EPA Great Lakes National Program Office. Funding comes from the Great Lakes Restoration Initiative.